I am still working on the memorial page to those who gave their lives in the Great War of 1914-19. 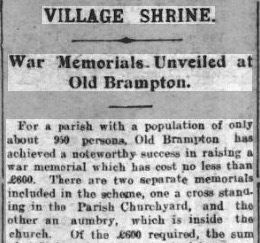 As part of my research I have been working through local newspaper archives and have now found a report containing the names of those young men from Old Brampton who made the ultimate sacrifice and who’s names were inscribed on the memorial at St Peter and St Paul’s Church. The memorial was unveiled on 7 November 1920 and commemorates the names of 25 young men killed in the conflict. At the time of writing only two of those are already commemorated on the role of honour attached to this site. I shall now be starting work to add the remainder. If you have any information about these individuals which will help us learn more of their story, please let me know. There are also many young men remembered on the Brampton St Thomas War Memorial who’s names I don’t yet have, if anyone is able to help by photographing the name panels I would be most grateful. Cutthorpe School has a roll of honour with the names of old boys who were killed. I have the full story of Ellis Bradbury along with photos. We live in Barlow and are compiling history of Barlow/Cutthorpe and Holmesfield. Thank you for contacting us Gina. 100 years after the Great War, we are still in debt to those who gave their lives, and indeed, to all those who contributed in their own way to the outcome of that terrible conflict. Best wishes with your history research, we look froward to hearing more about that too. We hold quite a lot of photos/stories. If you are local to the area perhaps you would like to visit and copy any items. My great grandad William Hopkinson is on the war memorial, he was a seargeant wounded on the Somme and then died from his injuries at Albert in France (where his grave is), at the end of June 1916. My father (his grandson) who is 86 visited his grave in Albert last year for the centenary. We are very proud of our heritage. I was born in Brampton on John Street in 1957, and moved up onto Chatsworth Road until my marriage in 1977. If you have any further information you would like added to his family story, please let me know, I’ll be pleased to add to what we already know.